Beautiful lamp and shade. Perfect for living rooms! 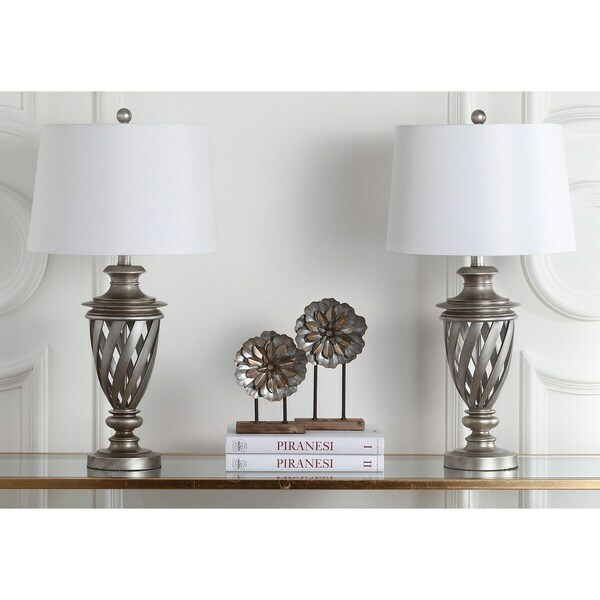 The Byron urn table lamp (set of two) is a nod to the timelessness of classic beauty and form. Its latticed metal base in antique silver and crisp white cotton shade will have guests in awe of this tribute to antiquity. We purchased these lamps to compliment our family room decor and were happy with the quality, antique silver color and white shades. Unfortunately, one of the lamps arrived damaged, which we accepted a credit for from Overstock, in lieu of returning the lamp. The photos on the Overstock site accurately depict the color of the lamps and white shade. I do not typically leave reviews,good or bad but I LOVE these lamps so much I knew I had to leave a review.I HIGHLY reccommend these lamps.not only based on the looks but they are high quality,the cord is very durable,they were packaged very,very well and to top it off they came with LED light bulbs.super fast shipping without paying for expedited.Could not be more pleased with this purchase!! I like these lamps except I was hoping for a white shade and these seem off white. Otherwise, these are great, very sturdy and well made. I bought them for my bedroom and they do look very nice. These lamps are so pretty! They add just the right touch in our living room. We've purchased several other Safavieh products as well, and have never been disappointed with the quality. I love love these lamps. Part of a re do in master bed room. Great design and feel they are on the night stands and the perfect size. Great design. These are lovely lamps for my living room, look very classy! These are perfect for our front room! As advertise - nice product.